We are delighted to announce the short-listed nominees for each award. The judging panel found it incredibly difficult to select a short-list from the over 350 nominees. The standard of nominations was so high, and represented the amazing work on LGBTI human rights and equality from all over Scotland. The short-list represents excellence in our diverse LGBTI communities and we are very much looking foward to the first Scottish LGBTI Awards Gala on the 10th September, 2015. Community Group of the Year – Recognising the LGBTI Community Group which has excelled in the past year – sponsored by Pride Glasgow. Culture Award – Recognising outstanding LGBTI achievement and inclusion in the arts. Diversity Award – Recognising diversity in the LGBTI community and initiatives which have sought to involve diverse identities – sponsored by LGBT Youth Scotland. 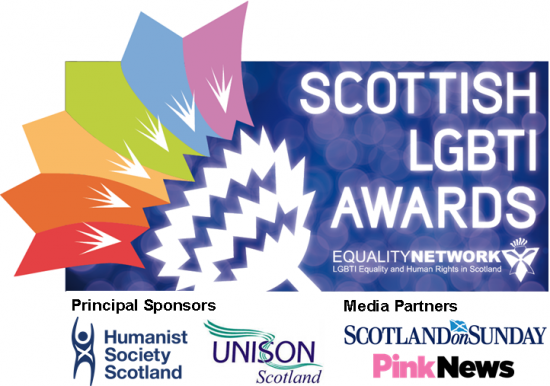 Equality Initiative of the Year – The award for the innovative Scottish campaign, initiative or action which has raised awareness or affected change. Event of the Year – Recognising the best event which has increased equality, or raised awareness of LGBTI issues. Journalist of the Year – Recognising the journalist that has made a significant contribution to LGBTI equality in Scotland – sponsored by Pink News. Media Outlet of the Year – Recognising the media outlet that has made a significant contribution to LGBTI equality in Scotland. Outstanding Campaigner Award – The best individual campaigner who has worked for change or inclusion. Politician of the Year – The politician who has contributed most to LGBTI equality and human rights in Scotland during the past year – sponsored by Scotland on Sunday. Public Body Initiative of the Year – Our public services have huge influence on change here in Scotland. This award recognises their work – sponsored by UNISON Scotland. Sports Award – The individual, group or initiative which has sought to improve LGBTI inclusion in Scottish sport. Staff Network of the Year – The LGBTI Staff network which has excelled over the past year. Student Group of the Year – Recognising Scotland’s outstanding LGBTI student group – sponsored by Humanist Society Scotland. Venue of the Year – The venue in Scotland which should be recognised for its services to LGBTI people and communities – sponsored by the Atholl Palace Hotel. Youth Group of the Year – This award recognises an outstanding youth group for their work.